You are all invited to the next Sorting Out event in February, 5 - 7th. 3 days in His presence you do not want to miss. Sorting Out is a unique deliverance ministry organised by Rev. Joe Olaiya, one of the foremost authorities in this area. With over 30 years of deliverance ministry experience and a track record of being led by the Spirit of God, Rev. Joe is able to bring his unique insights to bear and provide targeted prayer and ministration to help you out of your difficulties. 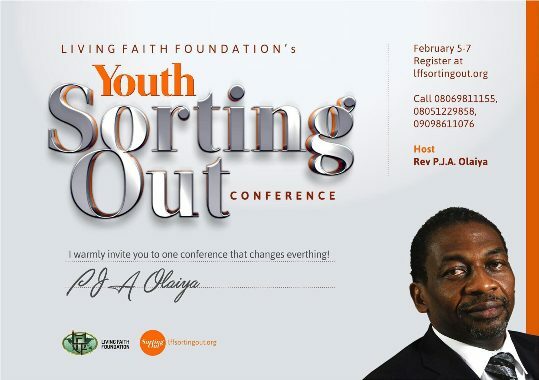 Sorting Out provides one-to-one ministration for every one that attends the programme. For this to happen, numbers are kept small and demand is usually high. Sorting Out has been held in different parts of the country and other parts of the world. There's now one specially designed for youth! God is so good! February! We are coming for you! Testimony Explosion! We haven't even stopped receiving testimonies since the last youth sorting out conference in December! From tumors being healed, to the deaf hearing, to years of seized inheritance being restored, to genotype change, to the fruit of the womb! You name it! God already gave us His promise and His children shall never lack, they will not beg for bread, they will not be barren! So many things happen in life and we don't even have an idea about why they happen! At the conference, you learn how to pray, what to pray about, how to have a personal relationship with God! It's 3 days of intense manifestation! Once He's in control of your life, you can only go up!!!! You are invited! Tell a friend to tell a friend! You never know who needs help or who's battling with something. There's nothing God cannot sort out! You'd be surprised how everything begins to make sense! Definitely an eye opener! The devil wants to keep you in darkness and make you unaware, but God knows everything! Nothing happens by chance! You know how you just keep thinking, 'why are all these things happening to me' then you say again 'it's a coincidence', that's the devil! Together, we can crush him! God is doing wonders for His people and we cannot wait for you to experience him! Kindly call the numbers in the poster for more information! You can also visit the website www.llfsortingout.org to register or to get more information. Kindly follow their Instagram page @lffsortingout for updates on their programs, events and daily motivation.